Robert C. Maynard, the first African American editor and owner of a major daily newspaper in the United States, was known as a trailblazing journalist who led efforts to desegregate newsrooms and educate minority students to pursue careers in journalism. Maynard was born in 1937 in the Bedford-Stuyvesant section of Brooklyn, New York. He dropped out of high school when he was 16 to work as a freelance writer for newspapers including the black weekly, The New York Age. He landed his first journalism job in 1961, when he joined The York Gazette and Daily in York, Pennsylvania. Five years later, he received a prestigious Nieman fellowship to Harvard University then served as a national correspondent, ombudsman, and editorial writer for The Washington Post. In 1979, Maynard became editor of The Oakland (California) Tribune, which had been called “the second worst newspaper in the United States.” But he quickly turned it around and purchased the paper in 1983, making him the first African American to own a major metropolitan newspaper. The Tribune subsequently won hundreds of awards, including a Pulitzer Prize in 1990 for its coverage of the Loma Prieta earthquake. Maynard also received dozens of awards, including eight honorary doctorates and the Elijah Parish Lovejoy award, named for the abolitionist who was killed by a pro-slavery mob in Illinois in 1837. 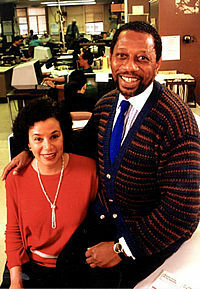 Robert C. Maynard Institute for Journalism Education; Bruce Lambert, “Robert C. Maynard, 56, Publisher Who Helped Minority Journalists,” The New York Times, August 19, 1993; Alice Carol Bonner, Changing the Color of the News: Robert Maynard and the Desegregation of Daily Newspapers (Ph.D. diss., University of North Carolina-Chapel Hill, 1999). (Ph.D. diss., University of North Carolina-Chapel Hill, 1999).